Most stories require a balance between exposition, description, and dialogue because this balance plays a major part in setting the pace of your piece. However, the balance between these three techniques is not equal. Dialogue allows the characters to interact with each other. Description shows what is happening, and exposition summarizes aspects of the story the reader needs to know. You do not need an equal amount of all three. In order to find the best balance for your piece, you need to understand when to use exposition, description, or dialogue. “James Allen Vase, you put that down right now,” Nana Vase orders. From these two lines of dialogue, a reader can tell Jimmy is motivated to keep playing while Nana Vase wants him to stop. A reader can also see the difference in age, who is in charge, and how each character is feeling. All from just two lines of dialogue. Dialogue also adds white space to the page. Each new line of dialogue is a new paragraph, therefore, the words on the page are spread out more. The reader feels like they are reading feaster because they are turning the page more often. This increases the pace of your story. It also gives your reader’s eyes a break. Pages filled with text are exhausting mentally and physically; that is why writers use paragraph breaks. Because dialogue adds white space, shooting for a roughly equal balance between dialogue and description is a good goal for most stories. Nana Vase doesn’t actually stomp into the living room, but her presence has a way of thundering into a space when she’s irked. Her mouth thins to a pink lipsticked line, and her hands move to her padded hips. Every nuance of Nana Vase’s physical description isn’t covered in this example. Instead, only the features important to the reader’s understanding of this moment are described. The shape of Nana Vase’s mouth and where she puts her not only show what she looks like but also how she’s feeling. Spend more time and words on the moments or details that impact your story. Description tends to create large blocks of text, which can be off-putting or exhausting. 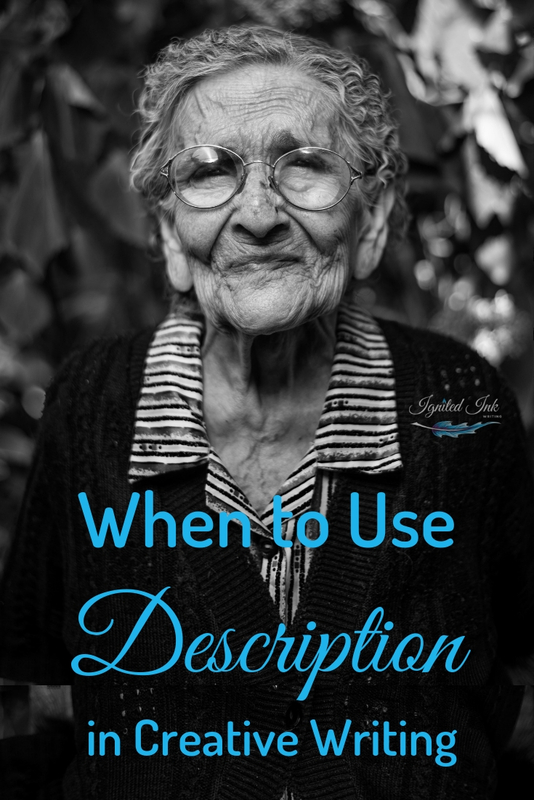 In order to keep your readers engaged and immersed, make sure what you are describing is essential to the plot and/or characters of your story like the Nana Vase example. Ever since I moved in with Nana Vase three years ago, I’ve spent most of my time in the living room. The reader doesn’t need to witness this character moving in or spending a bunch of time in the living room. All they need to know to understand the current moment and story is the character has been there a significant amount of time and is usually in the living room. Some of the best times to use exposition are when you’re trying to get your characters or plot from scene or moment A to scene or moment B. Your readers don’t need a description of each uneventful moment leading up to those scenes; they just need your characters to get there. The passage of time in particular is best told through a line or phrase of exposition. When your reader needs to know a bit of backstory to understand the current scene but they don’t need to witness that backstory in a flashback, exposition is a great tool. In general, whenever your reader needs to know something, but they don’t need to see/experience that information, exposition can be impactful. When you understand the best times to use exposition, description, and dialogue, you will have a more tangible control over the pace of your story as a whole and in each scene. Dialogue with frequent back and forth between characters speeds up your story. A conversation is action. New information is being revealed in each exchange. Monologues slow it down. Monologues focus on one character. Instead of revealing two potentially opposing motivations and perspectives, monologues only show one character’s motivation and perspective. That’s why monologues slow the pace while conversations speed it up. Pages of description in long paragraphs slow your story, while short paragraphs describing action/events speed it up. What you describe impacts your pacing. When your description advances the story, it keeps the story moving and therefore has a faster pace than tangential description. However lots of description all at once slows your pace. Small amounts of exposition delivering needed information keep your story moving, but paragraphs of exposition slow it down. 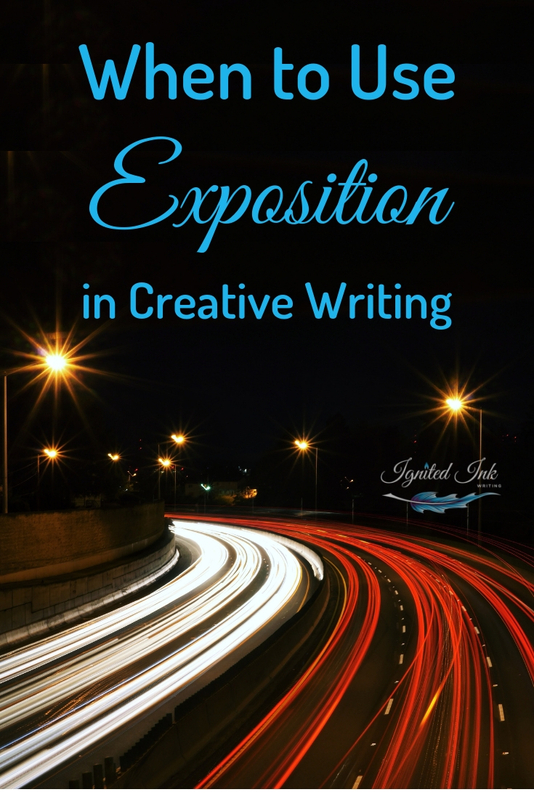 Even though exposition gets through your story faster, it quickly becomes boring, which kills your pace. However, small amounts of exposition allow you to skip over parts that would be boring in scene. Less exposition used in the right place keeps your story moving. Most readers like a faster pace. However, that doesn’t mean your story should be constantly speeding along. Some chapters are more effective when you slow down and spend words and time revealing needed information about the characters, plot, and setting. Other chapters are action-filled and need a fast pace. Overall, your story should constantly feel like it’s moving forward. When the story feels as if it’s become stagnant or nothing of import is happening is when your pacing has become too slow. Generally, the ideal balance for a story is roughly equal amounts of description and dialogue and limited exposition. When you flip through the pages of your book, you should be able to see the percentage of exposition and description versus dialogue. I say generally because every story and genre on different. You’ll have to discover the right percentage of description, exposition, and dialogue and the best pace to Ignite Your Ink. What is your preferred balance among exposition, description, and dialogue? Why? Share your thoughts in comments below. For more writing advice from an editor, subscribe to Ignite Your Ink. If you found this article helpful, subscribe to Ignite Your Ink. You'll be notified when new articles are available and receive writing advice from a professional editor just for subscribers. As a sign up bonus, you'll receive a free writing prompt designed to help improve your writing skills.